To indicate the buttons displayed in the message box, specify one of the following values. Depending on the hierarchy of windows in the application, the user may be able to move to other windows within the thread. All child windows of the parent of the message box are automatically disabled, but pop-up windows are not. MB_APPLMODAL is the default if neither MB_SYSTEMMODAL nor MB_TASKMODAL is specified. Same as MB_APPLMODAL except that the message box has the WS_EX_TOPMOST style. Use system-modal message boxes to notify the user of serious, potentially damaging errors that require immediate attention (for example, running out of memory). This flag has no effect on the user's ability to interact with windows other than those associated with hWnd. Same as MB_APPLMODAL except that all the top-level windows belonging to the current thread are disabled if the hWnd parameter is NULL. Use this flag when the calling application or library does not have a window handle available but still needs to prevent input to other windows in the calling thread without suspending other threads. Same as desktop of the interactive window station. For more information, see Window Stations. If the current input desktop is not the default desktop, MessageBox does not return until the user switches to the default desktop. Displays message and caption text using right-to-left reading order on Hebrew and Arabic systems. The caller is a service notifying the user of an event. The function displays a message box on the current active desktop, even if there is no user logged on to the computer. Terminal Services: If the calling thread has an impersonation token, the function directs the message box to the session specified in the impersonation token. If this flag is set, the hWnd parameter must be NULL. This is so that the message box can appear on a desktop other than the desktop corresponding to the hWnd. For information on security considerations in regard to using this flag, see Interactive Services. In particular, be aware that this flag can produce interactive content on a locked desktop and should therefore be used for only a very limited set of scenarios, such as resource exhaustion. If the function succeeds, the return value is one of the following menu-item values. The following system icons can be used in a message box by setting the uType parameter to the corresponding flag value. Adding two right-to-left marks (RLMs), represented by Unicode formatting character U+200F, in the beginning of a MessageBox display string is interpreted by the MessageBox rendering engine so as to cause the reading order of the MessageBox to be rendered as right-to-left (RTL). When you use a system-modal message box to indicate that the system is low on memory, the strings pointed to by the lpText and lpCaption parameters should not be taken from a resource file because an attempt to load the resource may fail. In the following example, the application displays a message box that prompts the user for an action after an error condition has occurred. 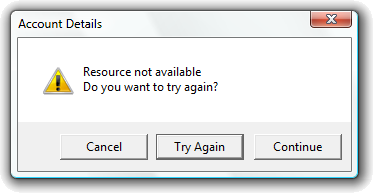 The message box displays the message that describes the error condition and how to resolve it. The MB_CANCELTRYCONTINUE style directs MessageBox to provide three buttons with which the user can choose how to proceed. The MB_DEFBUTTON2 style sets the default focus on the second button of the message box, in this case, the Try Again button. For another message box example, see Displaying a Message Box.